This year saw the first attempt to win back the America Cup. After endless negotiations, which have frequently been the prelude to these matches, Mr. J. Ashbury challenged for the Cup won by the America at Cowes in 1851, and held as a challenge cup by the New York Yacht Club. 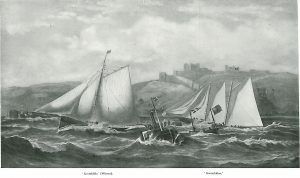 Before the race was sailed, however, he arranged an ocean match against the American schooner Dauntless, from the Old Head of Kinsale to Sandy Hook. On May 10 a long-sought meeting between the American yacht Sappho and Cambria took place. The course was to wind­ward and return. The vessels left the Nab in a nice easterly breeze, and Sappho at once showed herself the faster of the two, pointing higher and fore-reaching. Mr. Ashbury, the mark-boat not being in place, put up his helm to signify defeat. The second race was fixed for the 14th in a strong west-south-west breeze and nasty sea, but Mr. Ashbury declined to sail the course (round Cherbourg Breakwater) on the ground that it was not dead to windward. His contention not being considered valid, the race was awarded to Sappho. On the 17th the last match was sailed on a triangular course – 40 miles to windward, 40 on a broad reach, and 40 home. Cambria made a grand race on the wind, and held Sappho all the time, but overreached on the last tack, and was cut out. Sappho romped away of the wind, and easily won the third match. As showing the haphazard condition of racing at this time, it may be said that the matches were arranged without time allowance, and that Sappho carried 3,500 square feet more sail than Cambria, besides being considerably larger. Mr. Ashbury’s ocean match with Dauntless was begun on July 4 at 2.20 p.m. Cambria took a more northerly course than Mr. Gordon Bennett’s yacht, and arrived at Sandy Hook on July 27 at 3.30 p.m., beating Dauntless by 1 hour 17 minutes. Nothing was proved by this race, as the vessels sailed far apart, 900 miles (15 degrees of latitude) separating them at one time. Cambria sailed her America Cup race on August 9 in a moderate breeze against a fleet of no less than sixteen vessels, nine of which had centre-boards. The America herself was a com­petitor. The New York Yacht Club allowed Mr. Ashbury to choose his station at the start, and he took the weather berth. This, however, became the lee berth by a shift of wind. The course was 18 miles to windward and back, and from her bad berth and a slow start (with all sails down) she was last of the fleet for some time. However, in the broader waters outside she managed to work into eighth place. So ended the first America Cup race. Cambria took part in many of the American regattas, and, on the whole, performed indifferently. She had, however, but a slender claim to be the champion British schooner. In England this year she sailed in seven races, and only won one – Dover to Boulogne and back – and in every other race she was beaten by Egeria. The most successful schooner of this year was Flying Cloud, 75 tons, which won nine first prizes and one second. Her best performance was in the New Thames match, when she beat both Egeria and Cambria without time. She would have done the same in the Royal Thames race had she not entered with the second-class yachts. Egeria came next in prizes, with seven firsts and four seconds. Of the cutters, Muriel had the best record, with twelve firsts, Fiona coming next with nine first and three second prizes. The old Vanguard had five first prizes and one second, whilst Mosquito was able to boast three firsts. Lizzie and Vampire were nearly equal in the 20-ton class, and Naiad, a new yacht, was the best boat in the 10-ton class. She was built for Mr. A. Richardson by Dickinson of Birkenhead. Schooner yacht, Livonia, 280 tons. Built for Mr. James Ashbury by Michael Ratsey. Undeterred by his want of success with Cambria, Mr. Ashbury again challenged for the America Cup, and gave Mr. Ratsey the order for a new schooner of 265 tons, which he named Livonia. She was 106 feet 6 inches long on the water-line, with 23 feet 7 inches beam, drawing 12 feet of water and carrying 70 tons of ballast. Her displacement was considerably lighter in proportion to her dimensions than usual in England at the period, and the area of her sails (taken separately) was 12,228 square feet. A new composite cutter of 98 tons, Garrion, was built this year by Messrs. Steele for Mr. T. Houldsworth. She did not turn out a great success owing to her tenderness. Vanguard (Mr. W. Turner) won the first prize of the season in the Royal Thames Regatta. In this race Dan Hatcher fell overboard from Glance, but was picked up. The starts in the river matches of all three clubs were made, as usual, from moorings; but flying starts were becoming fashionable, and were doubtless much more fair where vessels of varying size competed together, as was nearly always the case. A quarter of an hour was allowed for crossing the line at the start, and any delay up to this limit was taken into account at the finish. Thus the down-Swin match was from a flying start off Southend Pier, Livonia sailed on this occasion, and in a strong north-east breeze she came in first, but, on a protest, Gwendolin took first prize. In the return up-Swin match Livonia again finished first, but lost on time to Gloriana. At the Royal London Regatta she first met Egeria, and was beaten. This was not a good trial; but next day Egeria gave the new vessel a bad beating in the Royal Thames match. Livonia won her first match in the New Thames Regatta in fluky weather. She had 4 tons of ballast removed for this race, and had the best of the luck. There was a strong south-west breeze for the match from Dover to Boulogne and back, and the start was flying, without any allowance for delay. The ‘time scale’ in use was an allowance of 15 seconds per ton up to 100 tons, and 5 seconds per ton above that. Livonia, on the reach to the French coast, passed Gwendolin, Egeria, and Oimara; but Guinevere, better piloted than the rest, was a long way ahead, and finished first. She neither gained on nor lost from Livonia on the passage home. 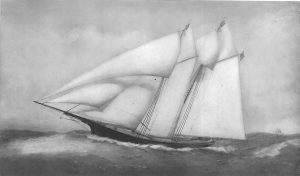 Livonia and Oimara sailed a match from Dover to Liverpool, which the new schooner won with ease. Oimara and Garrion met at the Royal Northern Regatta, when the new cutter came in first, but lost on time to Vanguard. There was a good class of ‘twenties’ on the Clyde – Shadow, Quickstep (a new vessel, built for himself by David Fulton), Calypso, Lizzie, and Queen. 10 minutes’ grace. Egeria won the Royal Victoria schooner match, though Livonia came in over a minute ahead. She had started, however, over 2 minutes before Egeria. A huge mixed entry of nineteen yachts started for the Ryde Town Cup, which was won by the 65-ton Gertrude in very light weather. Vanguard was the crack cutter of the year, Enid being next. Egeria was the most successful schooner, though Flying Cloud ran her very close, and Livonia had fair success. Foxhound was the most successful second-class yacht, Kilmeny and Alcyone being next. Lizzie was the crack 20-tonner of the year, and of the 15-tonners, Fairlie nearly tied with Ildegonda. Livonia reached New York on October 1. Mr. Ashbury’s challenge was preceded by the customary tedious correspondence. He wanted to sail twelve separate races, as representing twelve different clubs, but the New York Yacht Club compromised for the best four out of seven races. Single yachts were to defend the cup, but the club reserved the right to nominate any one of four yachts on the day of each race. The first match was on October 16, when Columbia was chosen to defend, and won by 28 minutes 2 seconds. She was again chosen for the defence in the second race, when Livonia was beaten by 10 minutes 33 seconds. 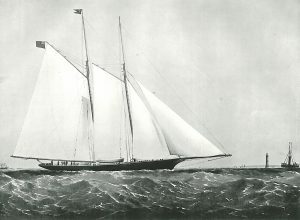 The centre-board schooner Magic was chosen to defend in the next two races; but on the day of the third, after great delay, Columbia was again assigned the honour. Livonia won this race in a hard wind by 19 minutes 33 seconds. She had the match in hand all the time, but Columbia was delayed for a little by an accident to her wheel. Mr. Ashbury also claimed the second race, on the ground that Columbia had rounded the mark in the wrong way, but his protest was disallowed. The fourth race was sailed against Sappho in a light to moderate breeze, and Livonia was beaten by 30 minutes 21 seconds. Sappho again defended in the fifth race, and, after a bad start, won by 25 minutes 37 seconds. Count Edmund Batthyany had a fine cutter of 105 tons, Kriemhilda, built this year by Ratsey. She was 82 feet on the water-line, with 17 feet 5 inches beam and 12 feet draught. She started in eighteen matches, and won seven first, three second, and three third prizes. Vanguard, however, was once more the crack boat of the year, and this was the more creditable because Fiona, ‘the terrible,’ was racing this season, and started twenty-four times. Vanguard started in twenty-one matches, winning ten first and four second prizes, whilst Fiona won five firsts and five seconds. Egeria was still the fastest schooner afloat, but Pantomime pushed her hard. Guinevere started only four times, and came in first in each race, winning three first prizes, including, £500 in a match of the Royal Victoria Yacht Club, from Ryde round the Nab, Owers, Cherbourg Breakwater; Shambles, round the Nab (passing south of the Island) and back to Ryde. In this race she beat Livonia by 3 hours 23 minutes. Oimarawon four first prizes and one second in sixteen starts. She sailed better than Garrion, which was not a success, although at times she gave some promise, as at Dart­mouth, when she beat Kriemhilda, Oimara, Fiona, and Vanguard. Another famous yacht was launched this season – Corisande, a yawl of 140 tons, built by Ratsey for Mr. J. Richardson. She only started in five races, but came in first four times, winning three first prizes and one second. The 40-ton class had three new vessels – Norman, built by Hatcher for Major Ewing; Alceste, built by Fife for Mr. H. Walker; and Myosotis, built by Ratsey for Mr. T. G. Freke. Norman and Myosotis were rather faster than Alceste, but the racing was excellent. The new trio found Alcyone a dangerous boat. In the 20-ton class Mr. David Fulton swept the board with Quickstep. No other 20-tonner could touch her. He built this vessel himself, and she was the successor of Ripple, 12 tons, and Glide, 15 tons, both smart boats. Lizzie, Vampire, Leander, and Shadow were fast vessels in this class. During a single-handed match of the Royal Alfred Yacht Club for yachts of 20 tons and under, which was sailed on June 1, the 5-ton Peri was lost in a squall, and her owner, Mr. Daniel J. O’Connell, was drowned. Mr. O’Connell was perhaps the best yachtsman and the most popular member of the club. Race for the Royal Irish Y.C. Cup, Kingstown, July 24, 1873. Showing Oimara, Flying Cloud, Iona, Fiona, Arethusa, Pantomime, Gwendoline and Garrion. A notable new vessel this year was Florinda, a yawl of 140 tons, built for Mr. W. Jessop by Nicholson. She won six first and five second prizes, as against Corisande’s one first and two seconds. Of the first-class yachts, Kriemhilda was the most successful, with ten first prizes and one second. She won the Royal Yacht Squadron Queen’s Cup, and also the Queen’s Cup of the Royal Albert Yacht Club, after a very fine race with Florinda. Mr. J. Ashbury won his first Queen’s Cup at Queenstown with Iona, which had a successful season. 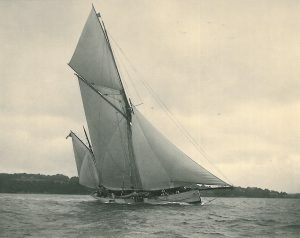 Mr. T. Broadwood’s 60-ton Ratsey-built Arethusa sailed remarkably well throughout the season, winning eight first prizes. Pantomime had the best record of the schooners, with thirteen first prizes and five second. Egeria won seven first and two second prizes. Flying Cloud and Gwendolin were dis­appointing this season, and Guinevere and Aline did not race. Britannia was a new Hatcher 40-tonner, built for Captain Hartwell. She was not quite able to tackle Myosotis, however, and was about as good as Norman. The racing was keen in the class, and there was little, after all, to choose between these three. 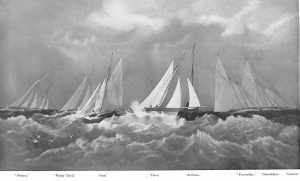 Of the 20-tonners, Vanessa, a new yacht built by Hatcher for Mr. H. S. Baillie, proved very fast, winning eleven first and two second prizes. She did not meet the celebrated Quickstep, however. The latter sailed well, and won seven first prizes. Mr. Thomas Brassey this year had his celebrated auxiliary Sunbeam built. Steam yachting was becoming increasingly popular at this time, and this, doubtless, accounted for the falling off in building large sailing schooners. It is a curious fact, and very typical of the British character, that steam yachts were for a long time regarded with great disfavour; so much so, indeed, was this the case that the Royal Yacht Squadron had an old rule forbidding the name of any steamer to appear on its list. Time has worked a wondrous change indeed ! Generally speaking, the weather this year was very wild. 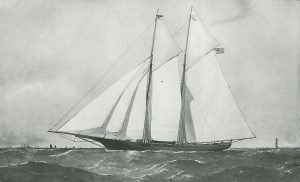 A new cutter, Cythera, of 110 tons, was built by Fife for Mr. D. Richardson. She found Neva, 62 tons (Mr. Holmes-Kerr), very troublesome, but proved herself to be a good vessel. Amongst her prizes was the Queen’s Cup of the Royal St. George Yacht Club. Florinda gave Corisande no chance when they met. Finish of Royal Thames Ocean Match, Nore to Dover for the Queen’s Cup, June 24, 1874. Showing Kremhilda (Winner) and Gwendoline. Kriemhilda was not so successful as in the preceding season, but she won the Queen’s Cup in the Nore to Dover match. Cetonia was the most successful of the schooners. She was built for Mr. W. Turner by Ratsey, and won eight first prizes and one second. Other new schooners were Sea Belle, 142 tons, built for Mr. H. Taylor by Harvey, and Corinne, 165 tons, built for Mr. N. Wood by Ratsey. Egeria, however, scored more victories than either of these two, and ranked next to Cetonia. Norman was just the crack of the ‘forties,’ with three second prizes more than Britannia, each winning nine firsts, and Blood­hound, a new yacht built by Fife for the Marquis of Ailsa, came next, with seven first and three second prizes. Myosotis, in new hands, fell sadly off. The racing in this class was splendid. Vanessa and Quickstep were once more the crack 20-tonners, but again they failed to meet. The rule of measurement generally in use during the years dealt with in this chapter was that of the Royal Thames Yacht Club, viz. Many clubs in earlier days measured the length on the keel, whilst others took it on deck between perpendiculars. The latter was the system initiated by the Royal Thames Yacht Club, and it was adopted by the Yacht Racing Association, formed in 1875.